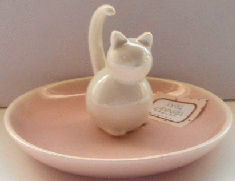 Here is a beautiful pink and white cat ring holder and trinket dish. Keep this dish beside the sink in the kitchen or vanity. A secure spot for your jewelry and coins. The dish is 4" wide x 2 1/4" high. The cat is 2 1/8" high x 1 1/2" wide. New.